Your Salesforce.com database will always function best when everyone in your organization contributes by interacting with it on a daily basis. As a system administrator, it’s not only your job to ensure that reports are created, data is kept clean, and new fields and workflows are created. It is also to make sure that your colleagues, the end users, are properly trained and feel comfortable in the Salesforce.com environment. Whether your organization is just starting to use Salesforce.com or has been using it for years, managing and providing easy access to relevant training materials and documentation will make end users more confident in using Salesforce.com, which will help improve user adoption rates, data accuracy, and make your life as your organization’s system administrator a lot easier. Let’s take a look at what resources are available to help you provide your end users with the materials they need to become successful contributors. These will be helpful whether everyone is starting to use Salesforce.com for the first time, user adoption rates have dropped off, or even if someone is looking to brush up on their knowledge. Training videos are always a good place to start familiarizing your users with the Salesforce.com platform. Forcify.me, a resource provided by Jackson River, serves up training videos created specifically for non-profit Salesforce users. All of the videos are currently free of charge during the site’s beta period. Two of the many videos they provide, “Orientation to Salesforce.com and the Nonprofit Starter Pack” and “Salesforce Training: Basic Activity Management” work as a great starting point for your end users, both giving them the bigger picture as well as covering the basics of Salesforce functionality. Pro-tip: Use the help text field when creating new fields in Salesforce to provide contextual field definitions and tips for your users. While it’s great that Jackson River’s videos provide a non-profit focus, and are fashioned for the Non-Profit Starter Pack, every organization leverages the Salesforce.com platform in their own unique ways that fit the work flow of their particular organization. Creating your own training videos using screen recording tools such as CamStudio, Jing, or Adobe Captivate allows you to provide on-demand training for the rest of your team that’s customized for exactly how your organization uses Salesforce. Alternatively, if your organization is working with a consulting firm to implement Salesforce, make sure to request a recorded copy of the training they’ve provided. Although video trainings work well to get everyone up to speed, creating an end user guide that’s specific to your organization’s processes is invaluable. Composed of a mixture of text and screenshots (or even embedded videos), the end user guide should be provide step-by-step instructions on how to execute the most commonly used Salesforce functions. This user guide should be stored in a place where everyone can access it and you can make updates to the documentation as needed, such as an internal wiki or shared file folder. You can even get fancy and embed it as a tab in Salesforce. 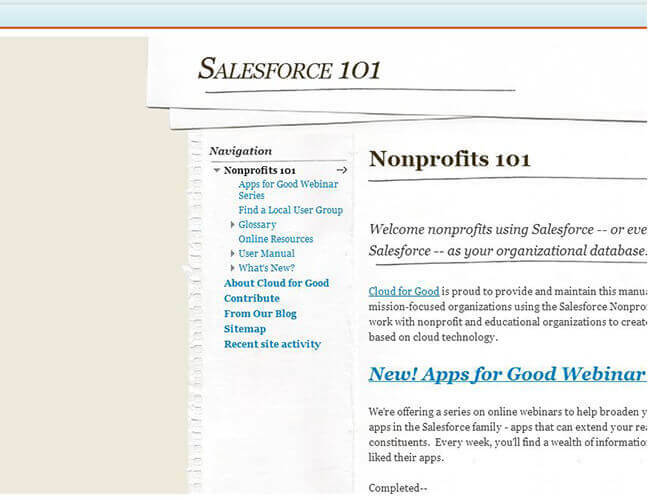 For a great example of this, check out our Nonprofits 101 app, a free resource we created that provides a knowledge-base for nonprofit and educational organizations directly in Salesforce. The end users in your organization aren’t the only ones who need access to training & documentation materials. You want make sure that you also have access to information you need in order to be an effective system administrator. Let’s take a look at some of the resources available to you. For starters, the training module provided by the Saleforce Foundation, “Getting Started: Administering the Salesforce Nonprofit Starter Pack” is a good place to start for yourself and any other system administrators in your organization. A couple other great places to find video resources specific to non-profit focused admins are the help videos on the Salesforce.com Foundation’s YouTube Channel, as well as the rest of the videos you’ll find on Forcify.me. For a truly immersive sys admin education, you can register for Salesforce.com instructor-led training classes at the discounted non-profit rate (50% off the list price) or contract a consulting firm to provide you with personalized advanced administrator training. You’ll also want to have your own documentation as well. If your organization worked with a consulting firm to implement Salesforce for your organization and migrate over your existing data, they should be able to furnish you with a design document that outlines where the existing data was imported to, as well as documenting custom fields and objects that were created for your organization. If not, it can be helpful for yourself and any other sys admin to create such a document. Additionally, you can enter in important notes into the field descriptions when creating or editing custom fields. Taking these measures should also help out anyone else stepping into a sys admin role should you win the lottery or get struck by lightning tomorrow. As you join the ranks of expertly trained Salesforce.com System Administrators, you’ll want to keep your knowledge fresh and skills sharp. One of the best ways to do this is to become a member of the non-profit Salesforce community. Two great methods of joining the conversation is by both joining your local Salesforce.com Non-Profit User Group, as well as the Power of Us Hub, which is like a global version of your local non-profit user group, only with less sandwiches. Pro-tip: Keep an eye on what applications are available on the AppExchange, both designed specifically for non-profits, as well as discounted for non-profits. Not only will you be in touch with what 3rd party solutions are available for your organization, but will also improve your witty banter at the next Non-Profit User Group.